Join your hosts at India, balance your body and mind, and become a meditation teacher. This training designed for those who want to learn standard technics of meditation in addition to yoga or separately. During this training, you will get an intermediate concept of meditation, philosophy of meditation, mantra concepts, anatomy and therapy of meditative practices, yogic nutrition, naturopathy. Vedansha is only one Institute who offers scientifically assessment of the depth of meditative practice under control of special devices. Please note that Yoga Alliance Certificate is available in form of YACEP if you already certified yoga instructor. Starting from January 1st, 2019, Vedansha are happy to offer absolutely great accommodation at reasonable price. Located in Tapovan, far from noisy streets and crowd in a newly built building, they offer single, shared twin, shared double, family suite and comfortable dormitory rooms. This type of accommodation will help you to relax and concentrate on your priorities of training. Vedansha also provide car parking and restaurant area. Please note that sometimes the power goes off in the whole Rishikesh city area. During these moments, you will have light, air condition, Wi-Fi in your rooms because of the special electricity generator. Guests will have the choice to stay at Vedansha's retreat center or the hotel. If guests book in the hotel, the classes will be held in Ashram (500 metres from Hotel). Vedansha provides free transportation till there and back. If you book a stay in retreat center, your classes will take place at the same place and Ashram nearby. The Vedansha Institute of Vedic Science and Alternative Medicine was founded by Yogachariya Dr. Sanjeev Pandey Ji. It was established to provide education in Vedic science, holistic treatment and support programs with yogic and Ayurvedic methods in common and non-curative diseases, and help humans control emotions, remove fears, improve their lives, find themselves in a society of modern technology, and open their power in order to feel harmony and happiness. The institute is accredited by International yoga alliance USA and followed it's policy on sexual misconduct towards the client, that makes all their programs safe and secure for female students. The institute keeps the ancient yogic tradition of Himalayan masters adapted to contemporary service requirements according to international standards of yoga education. Its teachers were born in yogic families and have scientific degrees in yoga, astrology, and Ayurveda. Its yoga masters have spent more than 90,000 hours on improving their practice of yoga postures and meditation. Its founder, Dr. Sanjeev Pandey, has spent more than 20,000 hours in deep meditation in the Himalayan mountains. Vedansha collaborates with medical doctors and performs research in yoga and cancer in Germany. It also performs special healing programs for people with different diseases to support their health. Its programs are based on centuries-old traditions and adapted to contemporary conditions that make its clients 99% satisfied. You have to have interest to learn Vedic science, personal work on body and mind and not only to spend vacation as on all inclusive resort. Vedansha are spiritual Ashram and do not allow following activity: eating non-vegetarian meal, smoking, drinking alcohol, abuse their staff, show any type of sexual misconduct, manipulating, annoying other clients, damage the vedansha property, study material, interrupt teaching process. Individuals with disabilities or ailments, people who have any disease or unfit before the course are advised to refrain from applying. If you join course, and feel worse after this, Vedansha will help you to arrange all required medical help, but they will not allow you to continue the course and your payment will be not refunded. Minimum age at the time of admission is 18 years. Applicants aged over 60 years could apply after consultation with Vedansha via email. This teacher training course requires educational abilities and the desire to study the program according to the standards of Yoga Alliance USA. Students are reminded to remain aware and respectful of cultural differences among the participants and teachers. Any disruptions to the teaching process or behavior deemed harmful to other students, teachers, or the institute's property is in violation of the rules and policies of Vedansha Institute. Violation of the school's policies may result in dismissal from the program without any refund of the course fees. The teachers are not fitness instructors, most of them are spiritual yoga masters who have a completely different way of life and devotion to their practice. Some of them are monks, pandits in temples or swamis. They request you to please be polite and respect their work. If you find something that not suitable for you or for your faith or mentality, please do not put the blame on them. Let them know at the front desk, online or just discuss with Founder Dr Pandey Ji directly if you want any changes and what you find not suitable for you. In 99% misunderstanding will be solved in a good way. The course language is English. Any other mentioned language is used for online communication and in some cases can be used in communication during the course on the place. If you wish to get a translator for any other language kindly request to ask about availability before booking. If a booking is done without the request of translation Vedansha have right to cancel the booking and refund the deposit. If translation will be requested on place Vedansha has right to dismiss the client from the course and do not refund the deposit. If a client request to arrange another school with appropriate language ability it can be done upon request if the school with this language is available in Rishikesh for extra costs. The booking should be performed by the person who is going to participate in the course. If a booking is done by the third person (relatives, friends, parents etc) the direct participant should send Vedansha an email or scanned copy of confirmation that he/she acknowledge the program, rules and regulations of the organizer. Any candidate who decided to change the program after arriving have to apply for it in written form. If you decide to cancel the course after arriving, Vedansha will have to charge amount that covered our costs of 30% of the course days as Vedansha reserve teacher, accommodation, meal prior to your arriving. During the course, according to weather, road conditions, and amount of students, Vedansha will offer different types of excursions in Himalaya & Rishikesh including visit a spiritual temple in Himalaya, meditation in a cave under the guidance of an experienced teacher, visit Ganga Aarti, waterfalls, and Bealtes Ashram. Sometimes excursion can be changed or replaced with an equal offer if the conditions of weather or any other issue took place. Yogachariya Dr. Sanjeev Pandey Ji is the founder of the Vedansha. 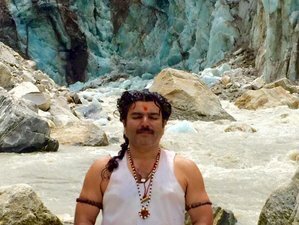 He has a PhD in yoga therapy and naturopathy, and he is a Himalayan yogi from the seventh generation. 1990 -1995 University of Lucknow with the diploma of bachelor of science (ZBC) in biology. 2008 - 2011 Master degree in yogic science and human consciousness and become a Yogachariya. Since 1999, he began his teaching career in yoga in Rishikesh. Since 2016, PhD in yoga therapy and naturopathy. E-RYT 500 and member of IAYT (International Alliance of yoga therapy). Ashish is a yoga master with a uniqueness that attracts the learners with his dynamic teaching style. He was born in a Vedic family and is a certified yoga teacher that has been teaching during six years. In this period of time, he had shown exceptional qualities of a yoga teacher in Hatha and Ashtanga style. He undertook the yogic training from the international school of yoga, Ved Niketan Dham in Rishikesh and gained the master degree in yogic sciences from the Sanskrit University in Uttarakhand. Awdhesh is an asana teacher for Hatha and Ashtanga Vinyasa yoga. He was born in Rishikesh, the capital of yoga. His yogic practice started from 2011 after he met various yoga masters who inspired him and encouraged him to come to yoga path. He began to study in Uttarakhand Sanskrit University yoga philosophy and started his own practice as well. He obtained positiveness, peace in mind, and physical health. Awdesh Semwal completed his diploma in yoga and other degrees in 2014. Having studied Ayurveda and herbal medicine at Kanpur in the Kanpur University in 1966, Dr. Usha completed her internationally recognized bachelor of Ayurvedic Medicine and Surgery in 1997. Her competence is evident in her extensive and varied experience during the past 20 years, has shared her expertise as a lecturer of Kaya Chikitsa at Himalaya Ayurvedic College (Bareilly, U.P. ), as a trainee physician in Arya Vaidya Sala (Kottakkal, Kerala), and Panchkarma specialist. Pandit Shiva Ji or Jyotish Acharya is a famous traditional Vedic astrologer in Rishikesh. He is well qualified in astrology and Vedic science, he completed his Jyotish Acharya (master degree in astrological science) and Ved Acharya (master degree in Vedic science and Vastu Shastra) from Sampoorna Nanda Sanskrit University, Kashi (Varanasi), India. He worked with great Himalayan Astro Masters and he lives and teaches in Rishikesh, sharing his knowledge of Vedanta, astrology, and Vedic karma kand. He is a master of yoga in traditional Hatha, Ashtanga, pranayama, and meditation styles. He lived in different ashrams during his childhood in north India and learned yoga from Himalayan masters. After he completes his master degree (Yogacharya) in Sanskrit University of Uttarakhand, he started to share his knowledge with his students. In free time Sandeep used to go to a spiritual place in Kedarnath and Badrinath to balance his energy and develop more in his practice. He is very polite and passionate teacher. He can teach either beginners or advanced students as well. Hemlata Bahaguna (Yoga anatomy, and physiology teacher, physiotherapist). She was born in New Tehri, located in the Indian state of Uttrakhand. After school Hemlata entered in combined (P.G.) Institute of Medical Science and Research (CIMSR), Dehradun where she is graduated in Bachelor of Physiotherapy, during graduation she started working in the field of ‘Effect of physiotherapy on Rib-Fracture & Spinal-Cord Injuries. She is an expert in the field of yoga anatomy & physiotherapy. Hemlata Bahaguna was working in 2009-2010 CMI Hospital, Dehradun (Physiotherapy department & faculty of anatomy). was born in Holy place and origin of Yoga – Rishikesh . He is practicing yoga since 2008. He is certified yoga teacher with Diplom from Sanskrit University of Haridwar. In 2013 he completed certification of 200 Hours of yoga alliance USA. He practicing Hatha, Karma, Bhakti, Mantra, Gyan, YIN yoga . These experience changed his life. Being a young boy he was learning yoga in Ashram from traditional yoga masters and implemented that knowledge in his teaching as well. Sonu follows yogic life style and 8 limbs of Ashtanga yoga. He is teaching beginners, intermediate & advanced classes. Lakhiram is one of the best and talanted meditation teacher in Rishikesh. He was born in Himalayan Village and was dedicated for yoga. He completed his education in Himalayan Yoga Institute in Haridwar and choose meditation as main subject. Since 7 years he is teaching in different schools in Rishikesh meditation, mantra, kirtan. Vedansh Pandey (yoga teacher) is a son of fonder and yogi in 8-th genertion. He is dedicated to continue the vedic tradition of Pandey Ji’s family and be a yogi. He is practicing yoga since childhood, knows very well all types of fire ceremonies, kriyas, shatkarmas. He is RYT 200. He is follower of Bharadwaj Gotra line, keeps bramacharya and doing self practice daily. He masters asana, pranayama, meditation techniques under father’s control and integrate them in his teaching. He is permanent student of spiritual Anandam Gurkul and learns there from himalayan masters secrets of hatha yoga. Jyoti is a professional female massage therapist. She completed her education in ayurveda therapy and massage in 1995 and performs massage to our female clients as well as shirodhara and other detox procedures as panchakarma. This training will take place at the Moksha Ashram in Rishikesh, India. During this training, you will enjoy a daily vegetarian breakfast, lunch, and dinner plus drinks. Every meal will consist of a special nutritious Ayurvedic and yogic menu developed according to the season. For the morning, you will enjoy a detox hot tea with special Himalayan herbs to make you stronger and improve your digestion. Other drinks will include herbal tea, black tea, masala tea, water, milk, and juice. Please be aware that the meal & beverages that are included during the course program and package are special yogic & ayurvedic. If you wish to try other meals from the Indian or Italian Menu in our Vedansha restaurant, extra costs will be charged. During your free time, you can book a detailed aura check-up with a written report about the aura statement, disturbances in aura if they are present, supporting methods, and treatment advices of a naturopathic specialist. You can receive an individual plan of asana postures, pranayama, herbs, and meditative practice. During this training, 1 ayurvedic massage is included in the price package. Other spa treatments are available, on request, for an additional cost. You can also opt for Volvo service from Delhi, however bus traveling could cause inconvenience for the first time travelers. Upon arrival to Dehradun Airport (DED) you can hire a taxi. Alternatively, you can hire a taxi from Indira Gandhi International Airport (DEL) or you can avail the Vedansha Institute of Vedic Science and Alternative Medicine transport package which covers the cost from Delhi Airport to Rishikesh by taxi and back, after the completion of the course. Rishikesh is a six-hours drive away from the Indira Gandhi International Airport (DEL). Airport: Jolly Grant Airport Airport transfer available: Jolly Grant Airport (US$25 per person) Additional charges may apply. You can request this in the next step. Vedansha Institute of Vedic Science and Alternative Medicine offers yoga classes, methods of asana, pranayama, meditation, Ayurveda, and retreats. The prices below include an ongoing special discount of 80 USD per package for a shared twin, double and private room. This offer is valid until the last course in August 2019. To benefit, book or reserve today!